This is my lunch and post workout meal for today. 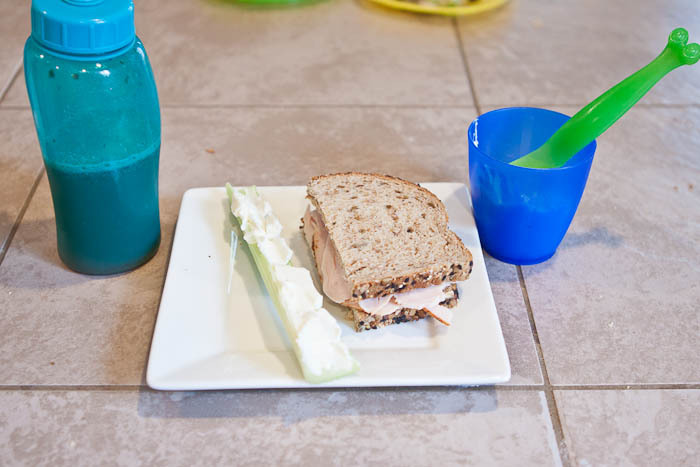 1 slice organic Dave’s Killer Bread, 56g of turkey breast, 1 tsp dijon mustard, 1 tbsp jalapeno yogurt, celery with Laughing Cow Light, 1 serving (133 g) 2% cottage cheese and 1 serving whey and water. I’ll be able to tell you the macro’s on this meal after I enter all my food on spark people in a few minutes. I’m never hungry after working out (after the marathon I literally had to shove spaghetti down my throat in fear of me dying from lack of calories) so I actually ended up eating the cottage cheese about an hour later. I think part of the reason for my lack of hunger is the amount of water I drink while at the gym so I come home with a full stomach.